I turned to my friend Justine Rice, who has a large flock of chickens in Truro and accidentally started breeding her birds last summer. Chicken breeding on The Local Food Report. Justine tells me, "It was end of July, very hot. We had a bunch of eggs in there, and one of the hens wouldn’t come off them. But I managed to get some out from under there, and I gave some to a friend and had the others for myself. And both of us cracked a weird looking egg into our frying pan, and realized that I had a broody hen." 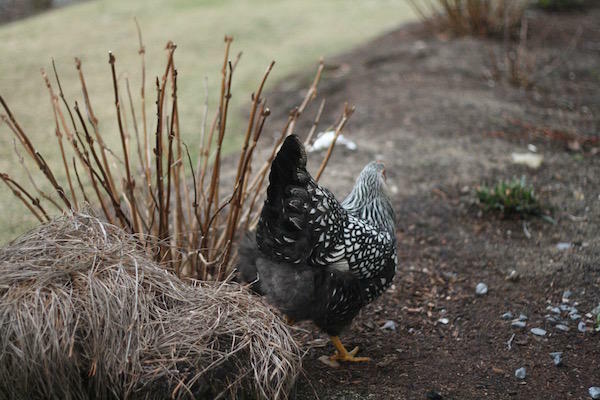 A broody hen, in layman’s terms, is a chicken who’s decided she wants to start a family. 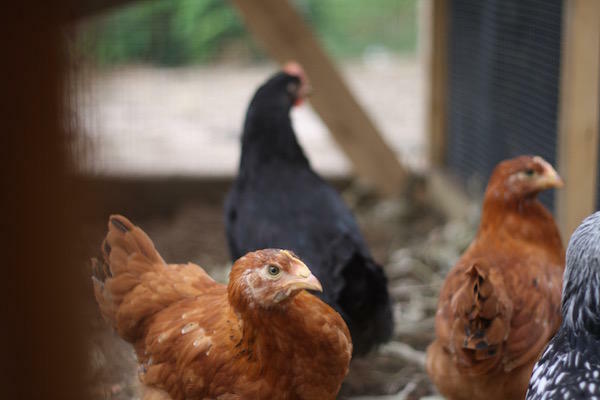 Most modern hens have been specifically bred to avoid broody behavior—a hen stops laying eggs when she starts incubating and hatching them, which isn’t good if you’re trying to sell eggs. Still, sometimes a hen’s reproductive instincts kick in, and once this happens, there’s not much a person can do to sway her. Justine said that the hen sat on the rest of them, and they got three chicks out of it, but one didn’t survive. And the other two were roosters. The hen sat for probably three weeks. Justine said, "There was no one going near her. It was dark in there, and she stayed on [the nest] the whole time. I would put a tiny bit of food in the corner for her, and leave a little bit of water, which she rarely even got up off the eggs to get. She made weird noises anytime anyone went into the coop during the day, and she tolerated them coming in at night. And that was it. She didn’t get off them." The biology of it all is fascinating. In the wild, a female bird of any species lays an egg a day until they are ready to start sitting on the nest, all the while leaving them in the nest at outside temperature. With chickens, it works the same way: a fertilized egg won’t start developing until a mother hen begins to sit on it continuously, keeping it at the same temperature as her body day and night. Hens also will sit on any chickens’ eggs, not just their own. This means farmers can isolate certain hens and roosters they want to breed, collect their fertilized eggs, and then set them under another hen who goes broody and is a good mother. No matter what day they were laid and who they were laid by, they’ll all develop on the same schedule and hatch at the same time. Justine says she didn't follow any rules and it all worked: "When I read up on it myself, I was like how did this happen? But it did happen, and I think she just seemed to figure it out." I asked Justine: when they came out, did you see them hatch? How did that happen? What did it look like? "The morning we were going away to Boston overnight, when we never leave, that’s was when that happened," Justine said. "So we watched it happen that morning. We had to leave around 1 o’clock, so we just left it in her hands. We left food there. When I read up, they usually stay underneath her for about 24 hours before they come out, or she’ll get off them, and I knew by the way she was being with the other hens that there was no way anyone was coming near her." She added, "She made a really weird noise." I asked her if she could make the noise. I heard they kind of hiss. Justine said, "No, I definitely can’t make it. Everybody stayed away, even when the rooster would kind of pop his head in, everybody stayed away. It was just—no. No." It takes about 15 days from the time a hen starts setting a clutch of eggs until they hatch. If there are weak chicks struggling to hatch, the mother won’t help, and if any eggs don’t hatch at all, she’ll abandon them. Instead she focuses all her energy on the healthy chicks. After Justine’s broody hen hatched her chicks, Justine moved them into their own crate, separate from the rest of the flock. One chick was weak and died right away. One of the others, a healthy rooster, was stepped on and has a lame leg—but has still grown to full size and is otherwise remarkably healthy. Justine showed me two chickens. "These we call the twins, because they’re our born-to-us ones." The chickens are huge. Justine thinks they're Rhode Island Reds. I asked her to describe their plumage. Justine said, "It's like a bottle green, isn’t it? Iridescent bottle green in their tail feathers, then they have a gorgeous sort of like a rusty color. Shiny, shiny rusty color, and then the brown plumage underneath. We’ve managed to keep them alive, where maybe in nature some of them wouldn’t have made it. They’re all sort of characters in the story." She finished by saying, "They definitely have taught me what to do, rather than the other way around." It’s clear when Justine talks about her birds how much they mean to her, and how much she enjoys caring for and learning from these birds, that have become more than anything, part of the family. Justine says she’s curious to see whether the same hen will go broody again this summer—and in the meantime, she’s thinking of expanding to goats. You can learn more about breeding and hatching chicks on Elspeth's blog, Diary of a Locavore. This piece first aired in March, 2018.